Description: It’s been two years since Peter Nimble and Sir Tode rescued the kingdom of HazelPort. In that time, they have traveled far and wide in search of adventure. 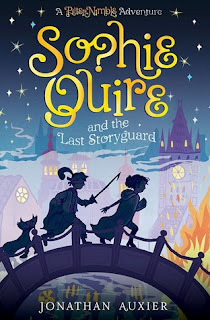 Now Peter and Sir Tode have been summoned by Professor Cake for a new mission: find a 12-year-old girl named Sophie Quire. Sophie knows little beyond the four walls of her father’s bookshop, where she works as a bookmender and dreams of leaving the confines of her city walls. But when a strange boy and his talking cat/horse companion show up searching for a rare and mysterious book, she finds herself pulled into an adventure beyond anything she has ever read. Positively brilliant and one of my favorite opening passages of a book. A book truly for those who love books, big and small. "It has often been said that one should never judge a book by its cover. As any serious reader can tell you, this is terrible advice. Serious readers know the singular pleasure of handling a well-made book - the heft and texture of the case, the rasp of the spine as lit the cover, the sweet, dusty aroma of yellowed pages as they pass between your fingers. A book is more than a vessel for ideas: It is a living thing in need of love, warms, and protection. And above all, a book must be read." "She had read many exciting stories about fugitives and runaways, and something that has always annoyed her was how little attention was paid to sensible preparations." "This was not how her adventure was supposed to go. People--real people that she loved- had died."